This city is beautiful. I have always been of the opinion that Albuquerque is an interesting place, especially when you ride public transportation. I frequently ride the bus to campus and to work so the bus stop scene was nothing new to me. It was a year ago that I found out about Mike’s “ABQ Bus Stop” blog, and from that that point forward I was motivated to take the same journey. The sun was reaching golden hour and I thought I’d get a head start at the Alvarado Transportation Center, the starting point for all bus routes. It was just after five and as always Downtown Albuquerque was full of people, those catching buses and just hanging around to catch up with others around. 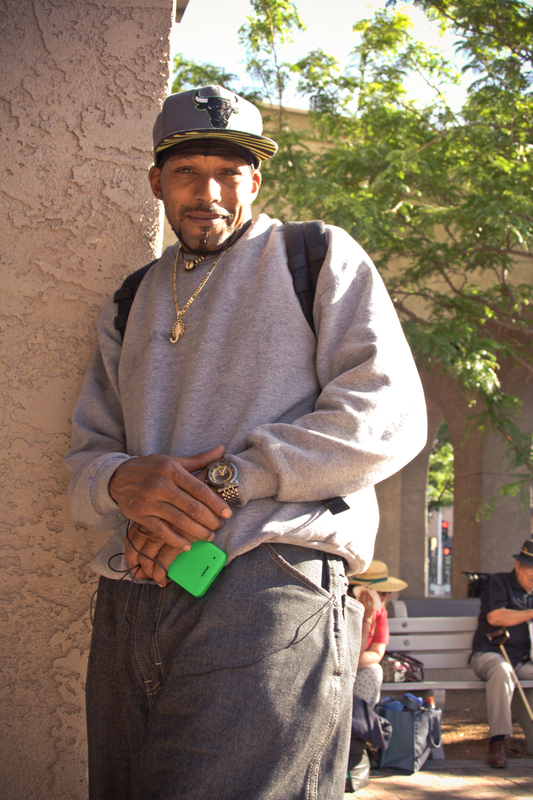 Right away, when walking around the transit center with a camera makes you stick out and sure enough I had attracted the attention of a group of males. One modestly asked what I was doing taking photos at the bus station of all places. Moises. “It’s just a piece of a larger project, or at least I hope so,” I replied a little taken in by Moises’ curiosity. Moises seemed to me like any other noisy young guy that was just hoping to grab the number of a young girl like me. Although, we talked on for a few minutes, and he expressed an interest in art as well. He was talking about how he wanted to venture out and work on a project possibly with a church or elsewhere to get started. Moises has many dreams and his ambition was a great start to my eventful bus ride. Soon after I parted with Moises and hopped on the 66 with Mike. The bus was full heading east. Admittedly I was nervous about coming up to someone taking their photo with the greater responsibility of telling that person’s story. Right away I headed to the back; two older males talked about what they were going to do upon arriving home, Moises was sitting on the bus as well chatting it up with other riders, and across from them was an older woman with her two granddaughters. The trip was lively, and everyone was just as curious about us as Mike and myself were of them. Then as we just passed San Mateo everyone on the bus grew quiet. A middle aged man in the front was having a seizure. Everyone moved out of the way to make room for the bus driver to get to the man. Moises who had been in the back darted across the seats to offer assistance, and right away he made an effort to help the driver get the man on his side. 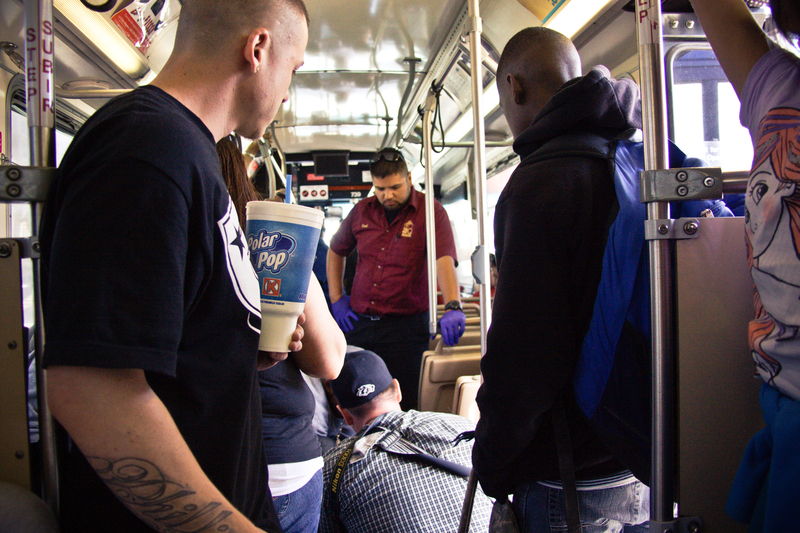 Eventually the seizure victim seemed to come out of and the bus driver called the paramedics. Moises made sure that the gentleman was okay then headed to the back. “How did you know what to do, man,” asked Mike. Moises stated that he was getting ready to graduate from a program at CNM where he learned how to handle such situations. From our conversation with Moises, as we were stopped waiting for the paramedics, it came to me that he was a genuine guy. 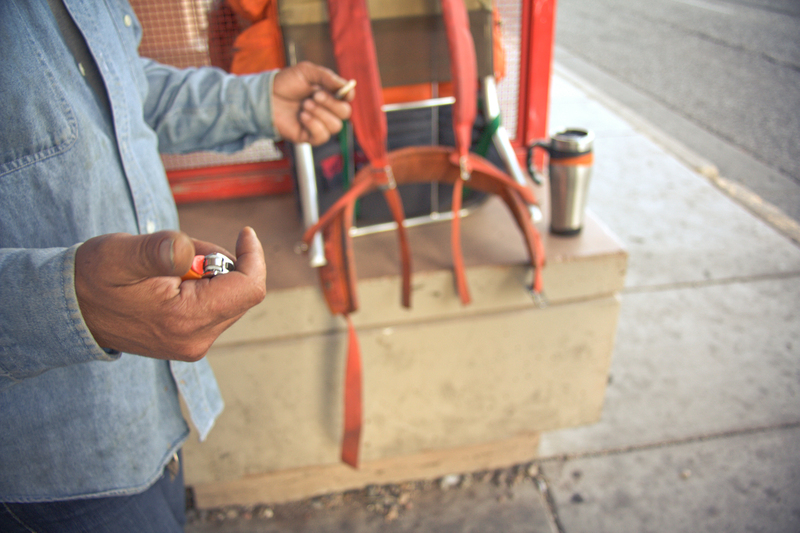 He truly cares about the Albuquerque community and wants to help those who are homeless or even victims of other situations. In the future I can see Moises’ large ambitions turn into something truly positive whether it’s in medical field, through a church, or just aiding those on the bus. People are not always what they seem. From the walk back from the Four Hills area, we ran into a man with a backcountry backpack. Grizzly. He was an older man with a bit of a beer belly that told us he was simply going where the wind took him. He was actually thinking of heading towards California. The elder man was smiley and very proud of his decision to leave Oklahoma to head west. We spoke about travelling and hitchhiking for awhile. He was a very amid about the idea of living off the grid, and I asked him if he enjoyed telling people his story. His rebuttal was, “why should I? Everyone is too darn busy on their phones.” I agreed. It’s not often that you have two people up with cameras then go one to ask you questions about your own life and experiences. It’s always sad to me that older people have a dull opinion about the next generation. That cellphones, fast food and technology are the only thoughts that consume us. While we may not acknowledge each other as Grizzly wished, I learned from this bus ride that people care for one another. In the end we inhabit the same space whether this be on the bus, in the city, or just to broad the world as we know it. Loved it!! It amazes me how much you have grown to the women you are today! I loved it and can’t wait to hear more stories and testimonies of people we would sometimes rather not even look at in the eye for fear of being disappointed or not be able to understand.